For an author with a reputation for writing very long novels it is maybe appropriate that the two longest stories in this short story collection were the best in it. Watching Trees Grow (which I'd read before many years ago) packs a lot of world-building into 80-odd pages and has an interesting premise (a murder investigation taking centuries with the investigator using newly invented technologies to go back to look at the case), although the characterisation was a bit flat and some aspects of the world-building were a bit under-explained. Another SF detective story, The Demon Trap, was probably the best story in the collection, re-using some characters from Hamilton's Commonwealth books probably helped with the characterisation compared to Watching Trees Grow and it was probably the most interesting story in terms of the SF elements (although some of the ideas later got reused in his Void trilogy). The other two Commonwealth-set stories were also reasonably good with some nice cameos for characters from the novels, although the title story did feel a bit contrived in its attempt to shoe-horn Paula Myo into a plot that shouldn't really have had anything to do with her and is a bit unsubtle in the historical allegory it is using. Touched by an Angel, the final Commonwealth story, gives some interesting background to some of the events in the Void trilogy and has an interesting portrayal of characters doing horrible things in causes that they believe to be justified. The remaining stories weren't anything special, If At First in particular was both dull and silly and almost certainly the first SF story to use R.E.M. 's Shiny Happy People as a major plot point. Footvote is another fairly short story but has an interesting premise - a man opens up a wormhole to colonise a new world but sets a long list of rules about who he'll allow to emigrate, this has some predictably negative consequences and an interesting dilemma for the main character who has to choose between her political principles and what is best for her family. 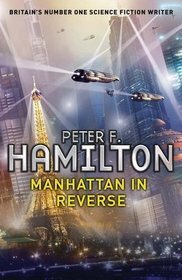 The Forever Kitten is particularly short at only 1000 words, but shows that Hamilton is still able to describe an interesting SF idea in a very small number of words. Overall, I'd say Hamilton's strength is mainly in the longer works but he's also a decent writer of short fiction.